Holiday villas to rent in Karaoglanoglu Village, only 5 minutes drive from Kyrenia resort centre. Karaoglanoglu make be a mouthful to pronounce, (every 'g' is silent, by the way) but it's a great location for a holiday villa by the sea in North Cyprus. Named after a Turkish officer killed in the 1974 landing on the beach here, Karaoglanoglu is the first good beach area west of Kyrenia, just a five minute drive away. Your villa holiday in Karaoglanoglu is all about being near the sea, and once you walk the few yards to the coast, there are plenty of pretty coves and bays to explore. Nearby Altinkaya Beach has gently sloping sands so youngsters can paddle to their hearts content, and often they share the water with other would-be water babies, learning to scuba dive at the nearby Amphora Dive centre. At night-time, the beach to be on is Kervansaray Beach, where the sunsets are almost impossibly romantic! A short drive to the west brings you to the Escape Beach Club, an almost perfect golden beach usually occupied with a lively crowd enjoying water sports, swimming, a beer from the bar, or just lying in the sun. For a cool day out from the coastal heat, head into the North Cyprus mountains to the Crusader's St Hilarion castle, a magnificent ruin perched high in the forests. If you're feeling brave, you can even paraglide back to the cast from here, soaring like a bird on the warm North Cyprus thermals. Historic Kyrenia is just a five-minute drive away or short taxi ride from your holiday villa in Karaoglanoglu. Kyrenia's heart lies at the curving Venetian harbour, a perfect crescent lined with cafes and restaurants in former carob warehouses. From the harbour at Kyrenia, medieval streets twist and turn up the hillside, each revealing a new fascinating shop, an artisan's workshop, or an inviting local bar. In the evening, locals and visitors alike love to dine on one of the rooftop restaurants overlooking the harbour, watching the sun set on another perfect day in North Cyprus. 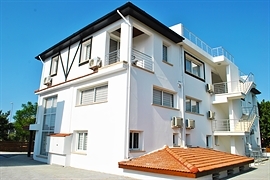 All villas for rent are close to an exceptionally good range of local restaurants in Karaoglanoglu. The Address restaurant is very popular during peak season, so you'll have to book and wear something smart to enjoy their full kebab with meze, or fresh fish dishes. The Ambiance is more upmarket, ideal for a special anniversary dinner or birthday meal during your villa holiday in Karaoglanoglu. Jashan is the longest-established Indian restaurant in North Cyprus, and the authentic Indian and Pakistani curries have just the right balance of spice and heat. For a family meal out, it's hard to beat the fun of the Stonegrill. Part of an Australian chain, you grill your own meat on a hot stone at your table, giving a taste of a barbecue without the flames, smoke or inevitable UK downpour! Fancy a winter break? Most of our villas for rent are available all year round here at Amy Villas. This page is prepared in 777 ms.